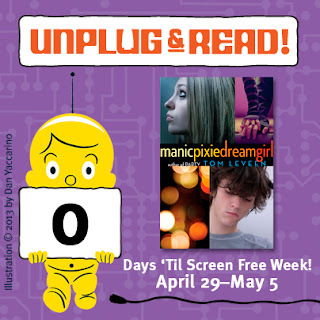 Wastepaper Prose : Screen Free Week begins today! Screen Free Week is here! Yes, I realize the irony in announcing this on a blog but bear with me. In our jacked-in society it's getting infinitely more difficult every day to shut off the smart phone, TV, tablet, computer, etc and harken back to a simpler time. During Screen Free Week Random House is encouraging everyone to UNPLUG & READ. Unplugging even for a short time can provide perspective on just how huge a role media plays in our lives. This is something I really need to consider doing for a few hours a day. I can't imagine how hard this might be for kids so used to having phones and tablets 24/7.